It finally happened! After what seemed like years of all her friends losing their teeth, the snaggletoothed smiles of her peers will no longer torment her. My seven (and a half) year old finally lost a tooth! I have to mention the half. We've long been prepared for this special moment. In fact, Santa brought the sweetest little tooth pillow... Christmas before last! I have it on good authority that the same cute pillow can be found HERE. I polled my friends to find out what the Tooth Fairy is offering for teeth these days. When I was a kid, it was one dollar per tooth. Considering inflation and the current median tooth fairy bounty, the Hubs and I estimated fair market value for teeth to be about five dollars per tooth. It was Hubs that insisted that the prudent pixie leave payment in the form of five golden dollar coins. It was important to me to capture this rite of passage. Admittedly, I searched for ideas on "lost tooth photo sessions." To my surprise, I came up with very little. Even if only using my iPhone, I really just wanted to be sure to document that sweet, little smile that is about to be forever changed. Speaking of iPhone photography... I took this photo session as an opportunity to try fun photo apps. Several friends have asked me about the program I used to fluff these basic phone photos. I'll tell you truly, it wasn't a cakewalk. I used a combination of several apps to get my end product. It was worth it though. I think they turned out pretty cute! These photos were styled using Snapeee, Insta Text, and PicFrame. Since then, I've discovered my absolute favorite photo app, Rhonna Designs. It's SO worth two bucks! Now that summer break is almost over, I finally have time for a long overdue post! I never know what our summer adventures will teach us and this summer we've learned a lot. Our Volunteer Odyssey was an incredible learning experience that introduced us to some of the most inspiring people in our community. (I blogged all about that experience here.) But I couldn't let the summer slip away without a post about another amazing Memphian! Earlier in the summer we discovered we had a raccoon living in the attic. Wildlife removal is quite expensive and I wasn't very keen on the idea of having strange men in and out of our house, checking traps. So, Jorma and I decided to buy a live trap and catch the little booger ourselves! What we weren't counting on is that our first catch would be a baby and that the mother would abandon ship, er... attic, after the tragic caging of her little one. 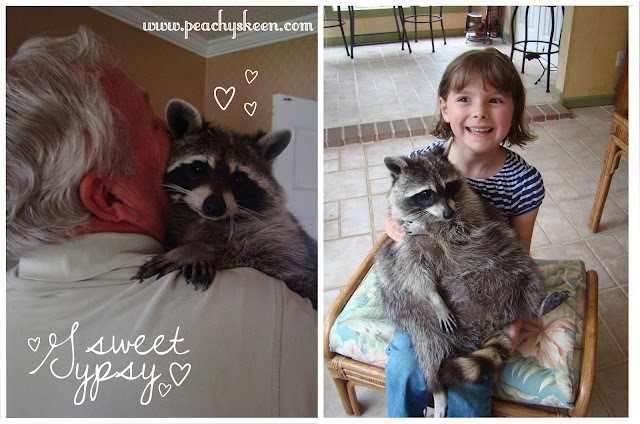 Though legally I'm sure we were never supposed to release our attic raccoon in just any secluded countryside, ethically there was NO WAY I was going to leave a baby to fend for himself. Now what? 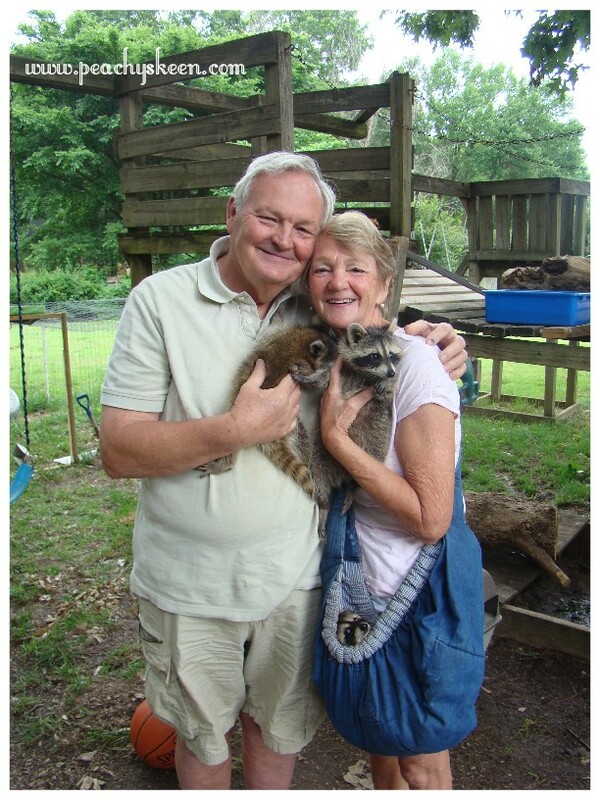 Well, a series of phone calls and web searches led me to a list of wildlife rehabilitators. If you live in Memphis, go ahead and pin this for future reference! Little did I know how lucky I was to select the first Shelby County woman on the list. Within an hour of calling her, Janie Kathryn and I were driving to her house. When we pulled up to the unassuming house on the edge of Germantown, we had no idea what we were in for. 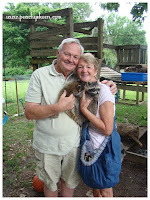 Claire and her husband Joe showed us around their home, where they were rehabilitating about a dozen baby racoons, and a few baby bunnies and opossums. It was amazing. They were amazing! They took time to teach us about the animals. They showed us the obstacle course used to acclimate the baby raccoons to climbing trees in the wild... occupational therapy for the little critters who might otherwise fall into an urban life of knocking over garbage cans. 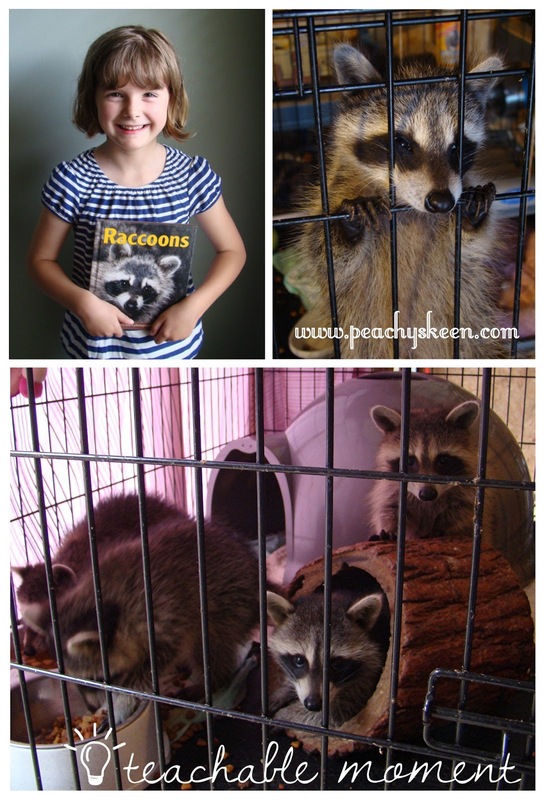 I was blown away by Claire's kindness and passion for helping these sweet babies. Janie Kathryn was blown away by all the critters to hold and that Claire and Joe were happy to feed her addiction to creature education. Did you know that raccoons bathe their food before eating it? Watch this video for a laugh! One of Claire's rescued raccoons has become part of the family. Gypsy, the umm... most robust raccoon I've ever seen is also the most lovable. She has been living with Claire and Joe for quite a while and is in the process of becoming an education animal. You might see her at Lichterman Nature Center one day! Veterinarians think that Gypsy might have suffered cognitive damage at some point in her life, causing her to be mute and very docile. She is so gentle and lovable, Janie Kathryn and I instantly fell in love! I hope to take my Girl Scouts to meet Claire and her creatures this fall. I am certain there is a badge to be earned! 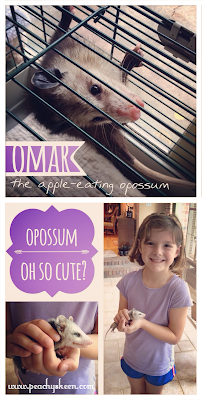 If you'd like to learn more about Claire and how she helps orphaned wildlife, you can visit her website! I had a good weekend with Big Al. I had fun making my packet. I am excited to be star of the week. I am still working on my star book, but here are a few photos of Big Al and me. Please join us as we celebrate Janie Kathryn's birthday by traveling around the world and exploring LUCK on all SEVEN continents. 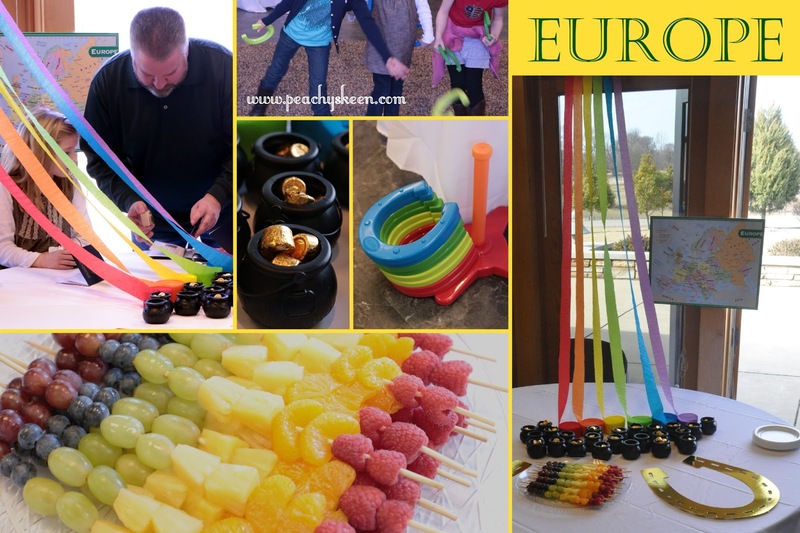 A lot (A LOT) of planning and preparation went into this party, but I admit to cutting corners and quite a bit of strategy. I saved money on party space by winning it in a raffle. Okay, this was luck more than strategy, but it was my intent to win. And almost everything that was purchased for this party has a dual purpose for my home or future classroom. 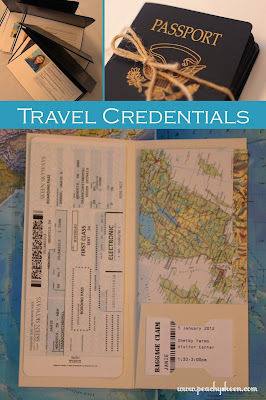 I sent out an evite ahead of handmade invitations, that way I only had to prepare "travel credentials" and favors for guests who would attend, cutting down material and postage costs. When guests responded to the electronic invitation they received an airline ticket, map, and baggage claim ticket in the mail. Passports were provided at the party. I purchased the pocket folders and matching envelopes on sale. There really are no reasonably priced airline ticket invitations. So, the Skeen Skyways boarding pass was designed by yours truly, right down to the perforated sections, rounded corners and security background. Watch out Homeland Security, I'm good! Perhaps, you will find this invitation available on Etsy one day... at a very reasonable price! As for the baggage claim tag- the pocket folder came with that sweet little section, I had to come up with something to fit into it. I just printed them out and cut them to size. Voila! The passport covers were a little trickier. For an authentic look, I knew I had to outsource and there is no shortage of custom passport invitations on Etsy. However, everyone seemed to only sell in large quantities (for weddings) or the sellers were not willing to sell covers only (I wanted to design my own pages). Then hallelujah, I found a merchant who had just what I needed and at much more reasonable price than many other Etsy shops. I rounded the corners of the covers and added my own pages, complete with pictures of party guests. See my passport post for more details about that! 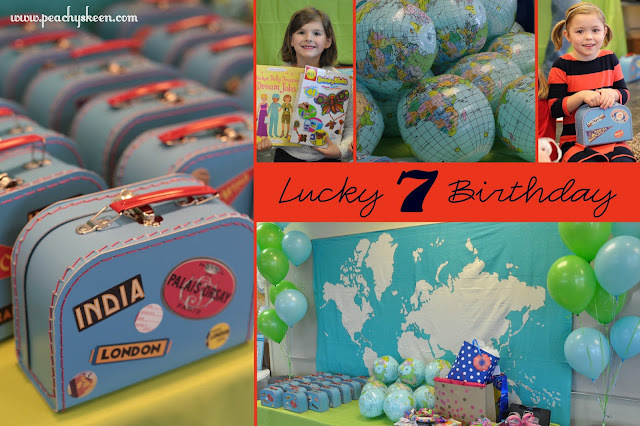 The travel theme was incorporated into the party with maps, globes, suitcases, and of course, travel credentials. Once all guests arrived, I divided them into smaller groups and issued their passports. Each group circulated the room, visiting different stations that represented the seven continents of the world. Once the guests learned about luck in each part of the world and enjoyed the snack, activity, or game at a continent table, they received a stamp in their passports and moved along to another party station. Resources: The mini suitcases were a major splurge, but I wanted them to be cute and I lacked the time and initiative to make them myself. I decorated each suitcase with vintage-style travel stickers by Cavallini. The inflatable globes were used a prizes for following directions and winning games. (They were originally supposed to hang from the ceiling, but I ran out of prep time.) The world map tapestry was a last minute find and one of my most favorite parts of the whole room. All tablecloths were purchased from Smarty Had a Party, an awesome business that sells tablecloths for less than I could have rented them! Hooray for my new banquet linens! 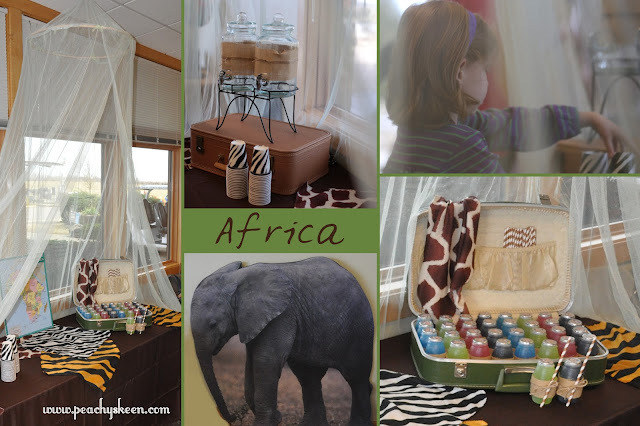 Africa served as the beverage station for all of the party-goers. I used some of my vintage suitcases to lift the water jugs and hold juice barrels (donated by my friend Lanie- yay!). I covered both beverage options with burlap scraps and twine. I think it makes it look more rugged and jungle-y. I borrowed the bed canopy, A.K.A. mosquito net, that Santa brought this year. 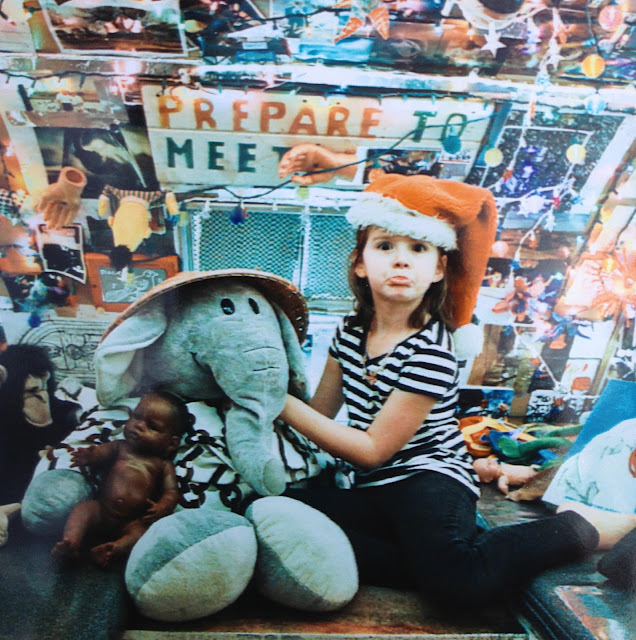 The activity for this continent was "Pin the Tail on the Elephant" and the various animal-print scarves were meant to be blindfolds. However, as the party unfolded, other games and dancing-like-seven-year-old-girls were more important. Miss Elephant served her purpose, though. Elephants are considered lucky in many parts of the world, including some African cultures. 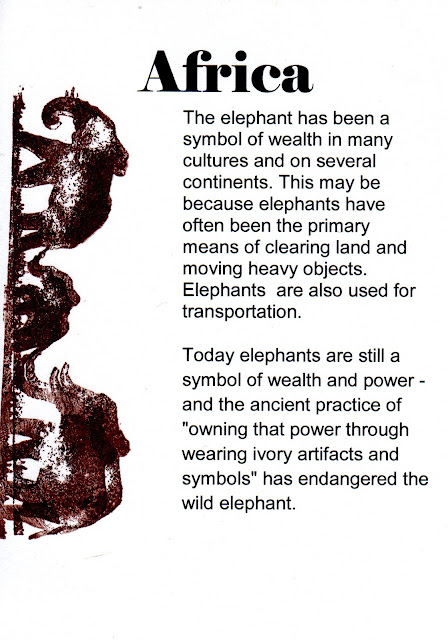 Resources: The scarves and 4.5 ft. elephant stand-up came from Oriental Trading. The paper straws came from a local bookstore, but Amazon has a great selection too! The zebra-print cups were cheapies from a party store. And the continent posters, which are part of each station were purchased as a set from Teacher Created Resources. Oh, Antarctica you were so much fun! I'm going to go ahead and admit that finding a lucky symbol from Antarctica was a bit futile. So, I might have stretched it just a little with the nautical star. See my passport post. I think it works well and keeps with the theme of the party. 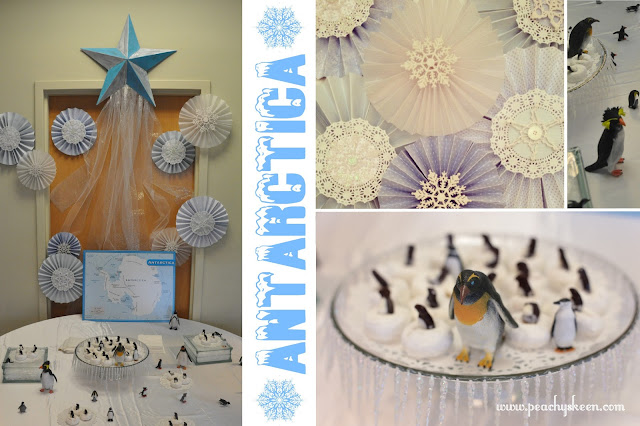 The activity for Antarctica was musical icebergs, which is similar to musical chairs, only with white vinyl "icebergs" on the floor, not chairs. 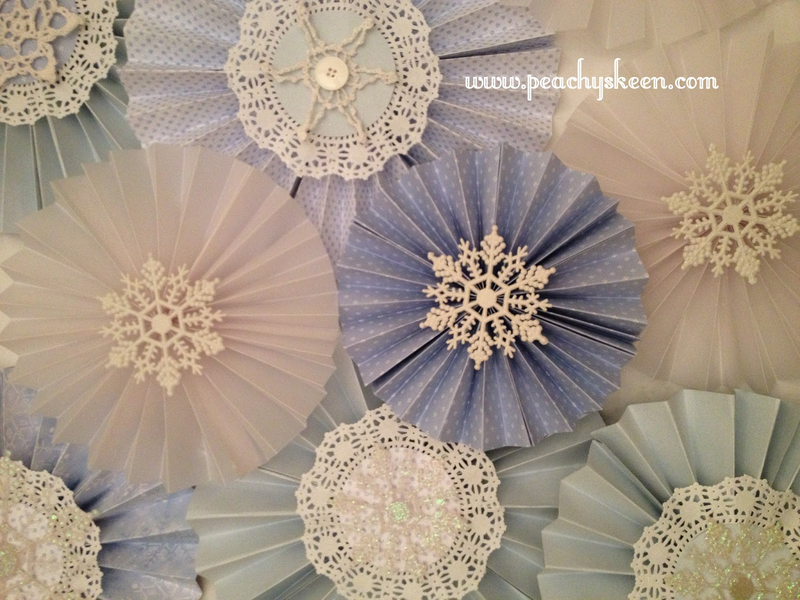 I used old Christmas decorations to embellish my handmade rosettes and icicle garland that I glued to a glass cake stand that is chipped. Resources: I made good use of my mobile Hobby Lobby coupons for this continent, purchasing the star (which I painted) small penguins, and KraftyBloks for 50% off, in-store. The five larger penguins and the yummy penguin gummies (and they were yummy!) were Amazon finds. Let's face it, there is seemingly no end to the symbols of luck or good fortune on the continent of Asia. 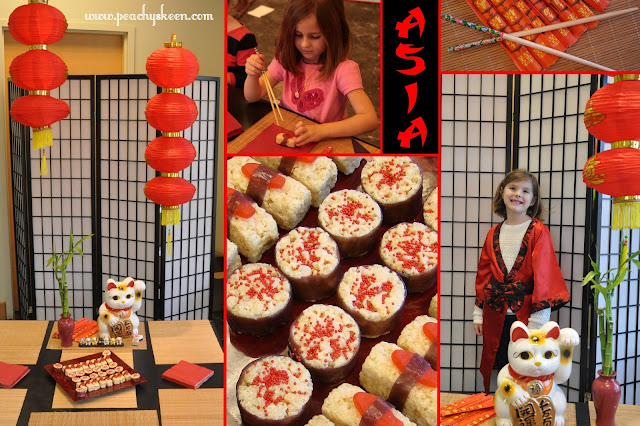 I had to make deep cuts or face the possibility of having only and Asian-themed party. Sorry, India it woulda been real. I went with ideas that fit into a cohesive color scheme. The girls tried on kimonos and posed for pictures as a fun activity for Asia. 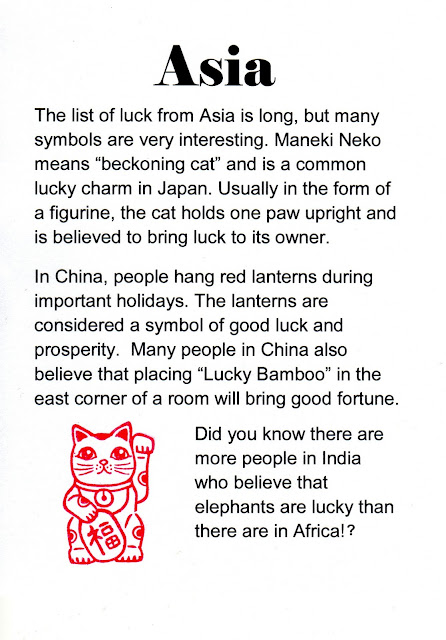 Resources: Maneki Neko, the lucky cat is actually a bank and was a gift for the birthday girl. I found him and the inexpensive little local imports store. 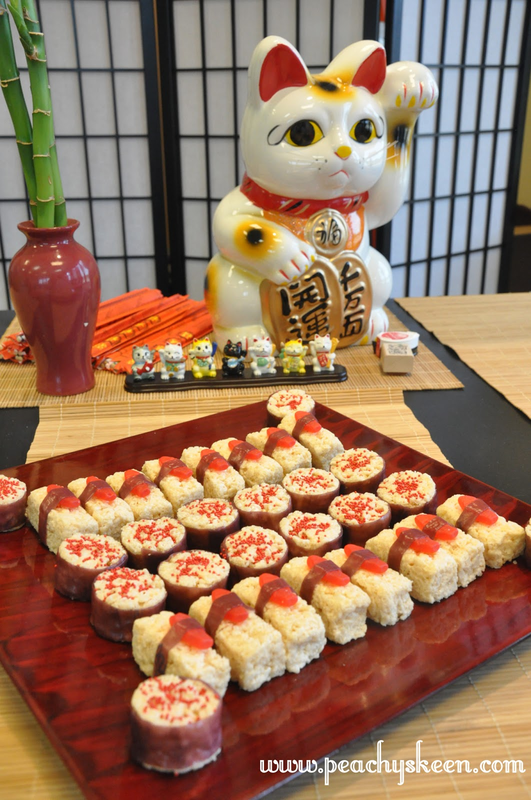 The sushi was a pinterest idea that was incredibly easy. For my version, I use rice crispy treats, purple fruit roll-ups, Swedish fish, and sprinkles. I had my husband build the table from a piece of MDF and a 4x4 from Lowes. The bamboo placemats were a Dollar Tree find (2/$1), the chopsticks and birthday fortune cookies (not pictured) were purchased at Oriental Trading. The shoji screen was another splurge, purchased from Amazon, but it fits nicely into my home decor. So, it was worth it! All the other Aussie trappings were purchased online. If you're still with me, we're half way through! 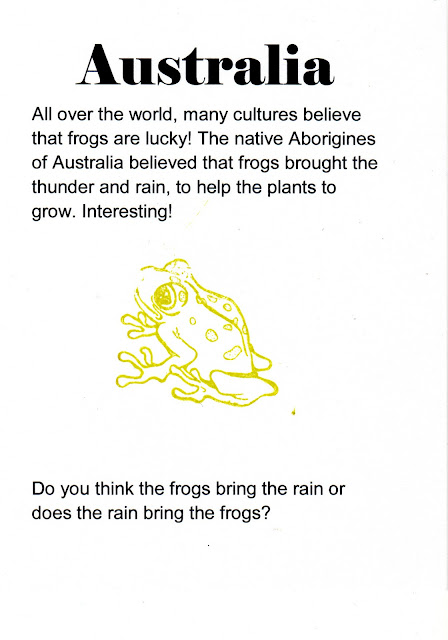 Here in Australia, the girls had a frog-jumping contest to see whose little plastic frog could jump the farthest. This was probably the least popular activity, but only because the frogs were kind of a bust. Hmmm, what to do with 12 dozen leftover cheap-o froggies? 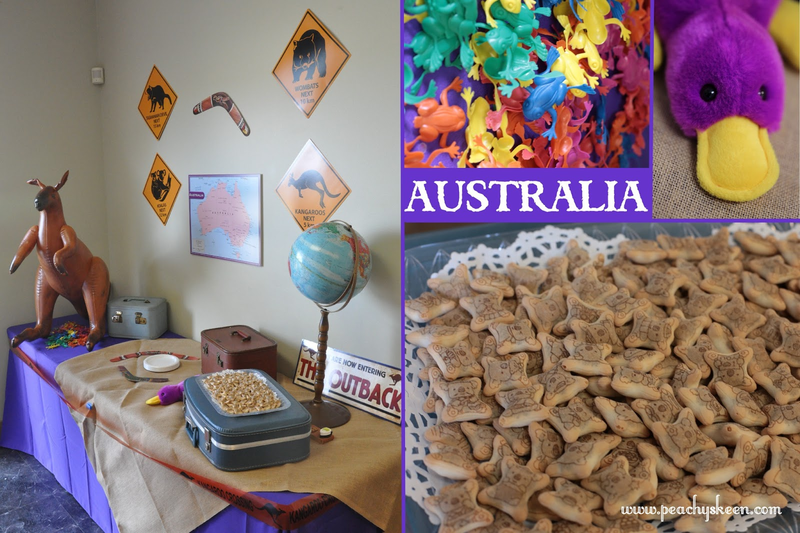 Resources: The chocolate-filled koala cookies are not actually Australian, but kept with the theme and were really delicious! The frogs were Oriental Trading buys. The kangaroo was an Amazon purchase that I watched for a while and grabbed when the price dipped very low. 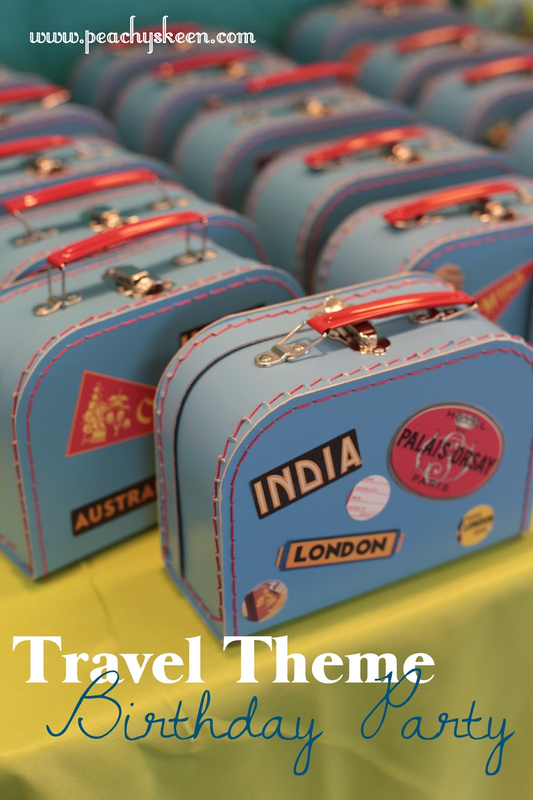 I also incorporated more of my vintage suitcases and vintage globe. Europe may have been the most colorful and rainbows guarantee favorite status. Europe boasted the only healthy food at the party. WhatEVER it was a party! 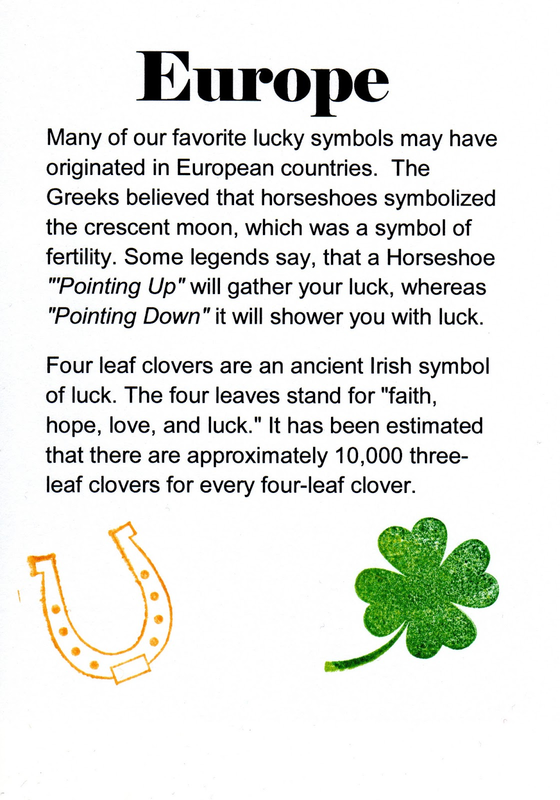 The activity was horseshoes, a lucky symbol of course. Treats included little pots of gold! Resources: I purchased the black pots 90% off at a Halloween sale the last time I was a Walmart, four years ago. The gold horseshoe table decorations were from Party City. The game of horseshoes was a Christmas gift last year. Santa knows what's up! I quickly learned, when sourcing materials for North America, that all things Native American are very party-trendy right now. I really could have gotten carried away with North America. I tried very heard to keep it simple. Well, financially simple. Resources: I created the totem pole myself- made from the box that once packaged the shoji screen. The dreamcatcher was a free gift with a donation to NAHA. 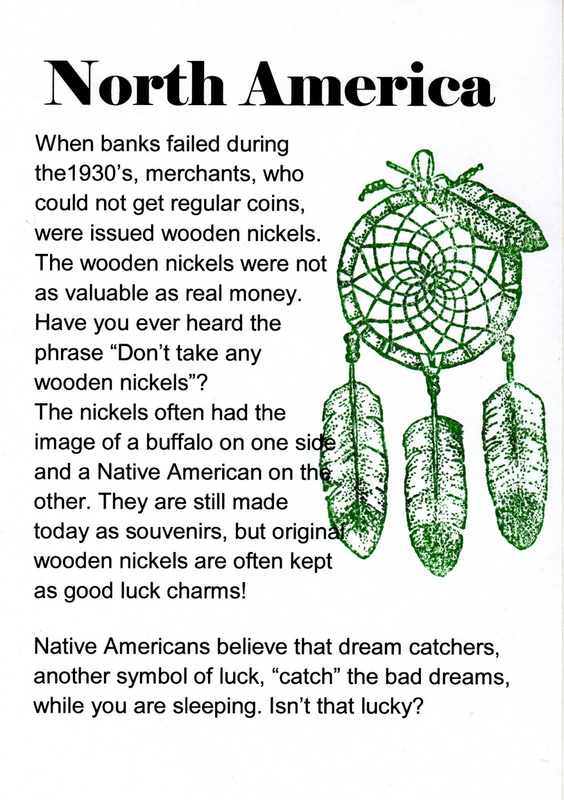 The buffalo nickels were a favorite find from another awesome Etsy seller, who sold me just the right amount! Last, but not least... South America. 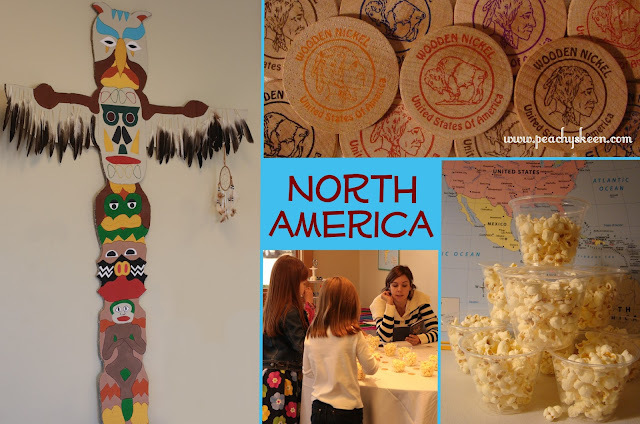 In the Americas, the girls enjoyed popcorn from the North American table. However, popcorn actually originated in SOUTH America. 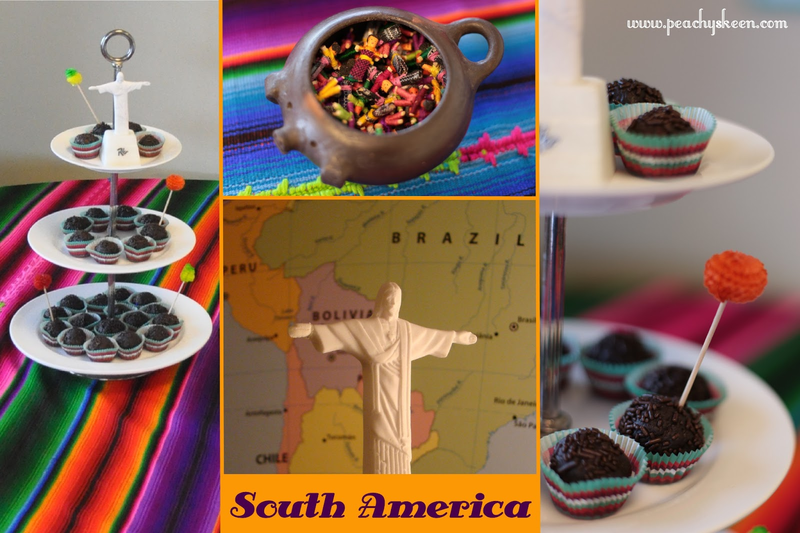 Another South American treat- brigadeiro. 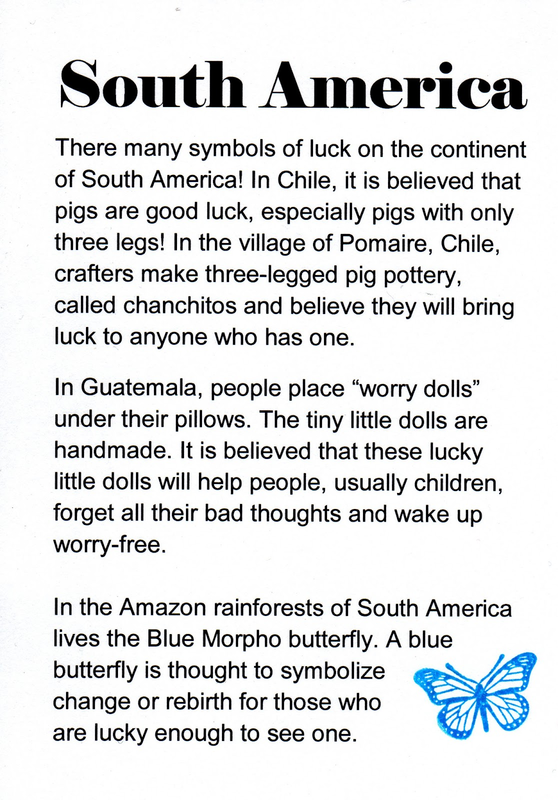 The activity in the Americas was an estimation station, where the girls tried to guess how many worry dolls were in the three-legged pig. Yes, three-legged pig! Again, see the passport post. The worry dolls, also a symbol of good fortune, are supposed to be placed under one's pillow at night to relieve the dreamer of any worries by dawn. 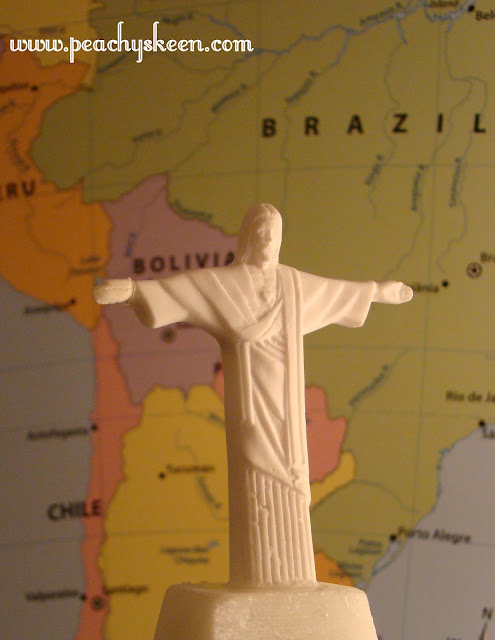 Resources: My South American pièce de résistance, Christ the Redeemer, came from a freind-of-a-friend, direct from Brazil. Love my friends! The gorgeous table cover was borrowed from my in-laws who purchased it on a medical trip to Honduras. 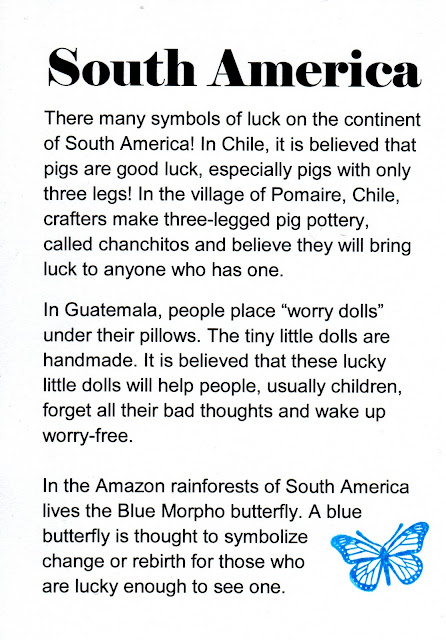 The handmade worry dolls I bought in bulk from a Guatemalan missionary, but they can be also be purchased here. And the Pomaireware pig came from a little shop outside of Chicago. If ever there was proof that I am a teacher in need of a classroom, this birthday party was it! My poor child may never experience a birthday without a learning objective. Oh well.